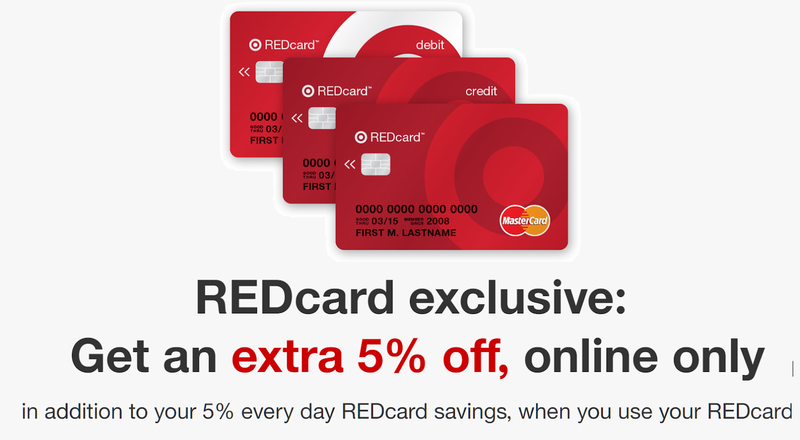 10% off Target Online Purchase For Target Redcard Holders. You get an extra 5% more than usual, a total of 10% off. Valid online only through 4/6. If you don't have a card you can sign up here for a card. They have a Debit card that does NOT required credit. it just takes the money straight out of your checking account. They also have a regular credit card you can sign up for. If you shop at Target this is a must have. You get 5% off on all purchases - even in-store and also you get free shipping online on all orders. AFTER YOU ENTER THE CODE YOU MAY GET AN ERROR THAT SAYS CANNOT APPLY, if so just refresh the page and it will show that it is applied. Offer excludes items sold & shipped by Target +™ Partners, alcohol, gift cards, prepaid cards, milk, select baby brands (DockATot, Halo, Infant Optics, Owlet, Peg Perego, Philips Avent), Levi's Red Label, LEGO, Bose, JBL, Sonos, Apple, Fitbit, Tile, Google Home/Mini/Hub, LG OLED TV, Samsung TVs, GoPro, DSLR cameras & lenses, mobile contracts, Nintendo hardware and Switch games, PS4 hardware, Xbox One hardware, Simple Human, Traeger, Harry's, Flamingo, power shave, power dental, Tylenol and Motrin pain relief, clinic & pharmacy, and Target Optical. Offer available online only. May not be applied to previous purchases. Offer expires 4/6/2019 at 11:59pm PT.